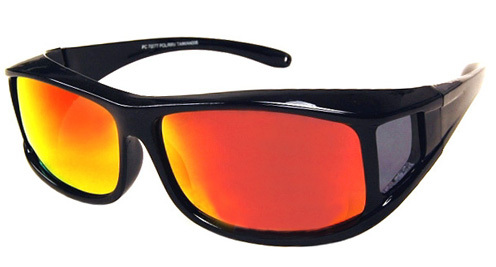 Have you been looking for Polarized Over Glasses Sunglasses with Color Mirrored Lenses. Look no further friend for our Airstream Over Glasses Sunglasses will fullfill your needs! I know the frustration a lot of us suffer when we try to find a pair of over glasses sunglasses/shields that usually leave us looking like we have arc welder goggles on our forehead. Well look no further and check out our Airstream revo color mirrored over glasses sunglasses solution. Airstream's have a smaller frame, so yes your sunglasses would need to be a smaller wireframe or smaller plastic frame type where the lenses are not to deep. I will give measurements below. 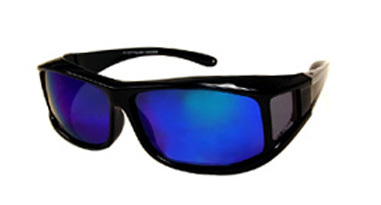 In return however, you get a more streamlined solution, with polarized lenses to boot and lenses that showcase a sharp looking color mirror coating in either cool blue or sunburst mirror. Throw in 100% UV400 ultraviolet light protection and a wrap around design that also keeps wind and dust out of your eyes and your good to go.